Subflooring— Nom 23/32 in. thick wood structural panels installed perpendicular to trusses with end joints staggered. Plywood or panels secured to trusses with construction adhesive and No. 6d ringed shank nails, spaced 12 in. OC along each truss. Staples having equal or greater withdrawal and lateral resistance strength may be substituted for the 6d nails. Subflooring — Min 23/32 in. thick wood structural panels, min grade "Underlayment" or "Single-Floor". Face grain of plywood or strength axis of panel to be perpendicular to trusses with joints staggered 4 ft. Plywood or panel mechanically fastened to trusses 12 in. OC in conjunction with construction adhesive. Subflooring-Min 23/32 in. thick T&G wood structural panels, min grade "Underlayment" or "Single-Floor". Face grain of plywood or strength axis of panels to be perpendicular to the trusses with end joints staggered 4 ft. Panels secured to trusses with construction adhesive and No. 6d ringed shank nails spaced 12 in. OC along each truss. Staples having equal or greater withdrawal and lateral resistance strength may be substituted for the 6d nails. Gypsum Board*-One layer of nom 5/8 in. thick, 4 ft wide gypsum board, installed with long dimension perpendicular to joists. Gypsum board secured with 1 in. long No. 6 Type W bugle head steel screws spaced 12 in. OC and located a min of 1-1/2 in. from side and end joints. The joints of the gypsum board are to be staggered a minimum of 12 inches from the joints of the subfloor. Floor Mat Materials*-(As an alternate to the single layer gypsum board) - Floor mat material loose laid over the subfloor. Gypsum Board* -(For use when floor mat is used) Two layers of nom 5/8 in. thick, 4 ft wide gypsum board, installed with long dimension perpendicular to joists on top of the floor mat material. Gypsum board secured to each other with 1 in. long No. 6 Type G bugle head steel screws spaced 12 in. OC and located a min of 1-1/2 in. from side and end joints. The joints of the gypsum board are to be staggered a minimum of 12 inches in between layers and from the joints of the subfloor. b. Steel Framing Members* — Used to attach furring channels (Item a) to trusses (Item 2). Clips spaced 48 in. OC. RSIC-1 and RSIC-1 (2.75) clips secured to alternating trusses with No. 8 x 3 in. coarse drywall screw through the center grommet. RSIC-V and RSIC-V (2.75) clips secured to alternating trusses with No. 8 x 2 in. coarse drywall screw through the center hole. Furring channels are friction fitted into clips. RSIC-1 and RSIC-V clips for use with 2-9/16 in. wide furring channels. RSIC-1 (2.75) and RSIC-V (2.75) clips for use with 2-23/32 in. wide furring channels. Adjoining channels are overlapped as described in Item a. As an alternate, ends of adjoining channels may be overlapped 6 in. and secured together with two self-tapping No. 6 framing screws, min 7/16 in. long at the midpoint of the overlap, with one screw on each flange of the channel. 4B. 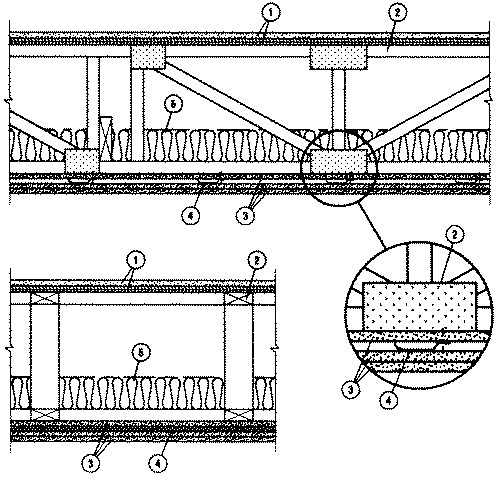 Steel Framing Members* — (Not Shown) — As an alternate to Items 4, furring channels and Steel Framing Members as described below. 4C. Alternate Steel Framing Members* — Not Shown) As an alternate to Item 4, furring channels and Steel Framing Members as described below. b. Steel Framing Members* — Used to attach furring channels (Item a) to the wood trusses (Item 2). Clips spaced at 48" OC and secured to the bottom of the trusses with one 2-1/2 in. Coarse Drywall Screw with 1 in. diam washer through the center hole. Furring channels are then friction fitted into clips. Ends of channels are overlapped 6" and tied together with double strand of No. 18 AWG galvanized steel wire. 5. Batts and Blankets* — Any glass fiber insulation bearing the UL Classification Marking as to Surface Burning Characteristics and/or Fire Resistance. Insulation secured against the subflooring, held suspended in the concealed space or draped over the resilient channels (or furring channels) and gypsum panel membrane. Minimum density of 0.5 pcf with no limit on overall thickness. 6. Finishing System — (Not Shown) - Vinyl, dry or premixed joint compound, applied in two coats to joints and screw-heads. Nom 2 in. wide paper tape embedded in first layer of compound over all joints. As an alternate, nom 3/32 in. thick veneer plaster may be applied to the entire surface of gypsum board.